Detective Inspector Mick Johnston: "it's a fairly unique set of circumstances"
Police in Tasmania have used a blood sample from a leech to identify a criminal, in what is believed to be a world forensic first. Eight years ago, a group of thieves robbed 71-year-old Fay Olson in her home. Police found a leech at the crime scene and took a sample of the blood it had consumed for DNA profiling. In 2008 Peter Alec Cannon was charged over an unrelated drug offence and his DNA was found to match the sample. Cannon has now admitted aggravated armed robbery. Wearing a large hood and carrying a stick, Cannon, 54, and his accomplice appeared at the back door of Mrs Olson's home in September 2001. They then forced her to open a safe and escaped with Aus$550 ( US$510, £310). When police came to investigate the robbery, officers found a leech near the safe, and the resulting DNA sample was recorded in the Tasmania Police DNA offender database. Cannon would probably have got away with the crime had he not been charged with drug offences late last year, and asked to give a DNA sample - which matched that from the crime scene. 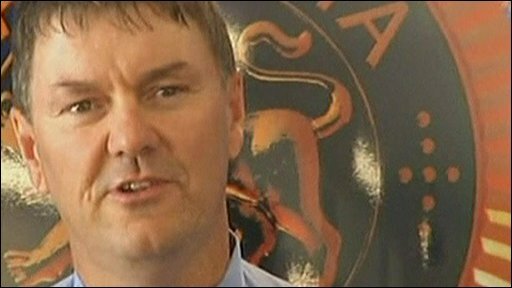 Detective Inspector Mick Johnston, who was involved in the police investigation from the start, said Cannon's conviction validated the use of DNA technology. "It's a testament to DNA evidence and the legislation that allows us to keep such evidence in relation to unsolved crimes - this is a fantastic result," he said. Mrs Olson "waited a long time for closure to this matter and it's nice to be able to deliver that," Mr Johnson told ABC radio.